I love granola bars. They have always been my go-to snack when I am on the run or out and about. 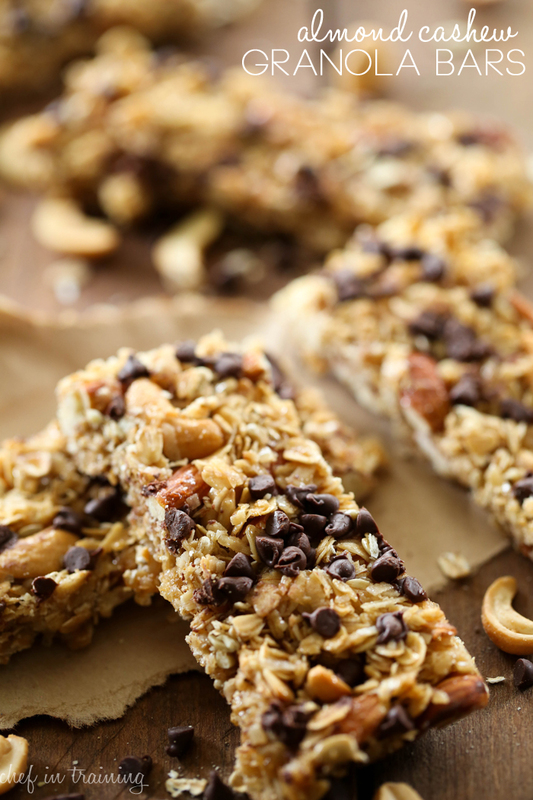 If you want to try a granola bar from scratch, give this one a try! It couldn’t be easier! And something about homemade always makes things more tasty. With kids in school, this recipe is going to become a regular around our house! We love them! These are so easy to make, have a delicious flavor, yummy crunch and are perfect for on the go snacks! In a large bowl, toss the oatmeal, coconut, almonds, sesame seeds, and cashews together and spread them out evenly over the cookie sheet. Bake for 12 to 15 minutes. Transfer back to mixing bowl and turn the oven down to 300 degrees F.
In a sauce pan melt butter, honey, brown sugar, and salt. Bring to a boil over medium heat. Cook and stir for 1 minute and then pour over oatmeal mixture. Stir to evenly coat. Pour the mixture back onto the sprayed cookie sheet and press down with your hand. Bake for 30 to 35 minutes. Remove from oven and sprinkle chocolate chips over the top. Press into the granola. Let cool for 2 to 3 hour and then cut into bars. Nikki these look so amazing!! Homemade granola bars are my THING! I love them and I usually use PB and so seeing AB is a nice twist. And mini choc chips ALWAYS in bars, always. Full size just fall out and that's never good to lose your chocolate :) Pinned! Yum! Simple yet amazing. My kiddos would love these. Do you toast the coconut with the nuts? It says to melt butter but, I do not see it listed in the ingredients? so sorry about that! It is 6 Tablespoons butter. The recipe is now updated to say so. Thanks for catching that! How much butter?! This looks great!! When do you add the coconut? I didn't toast the coconut, I tossed it in with the nut and oatmeal mixture after it was toasted before dumping in the hot honey mixture. I added the vanilla to the hot mixture while it was boiling. I also didn't press the mixture into the pan with my hand. Its molten hot! Use the back of a wooden spoon. The recipe is good, there are a couple steps missing. These are delicious. I have made them twice. Only complaint I have is that after baking the honey mixture seems to seep to the bottom of the granola bar instead of staying spread throughout -- making the bottom very sticky. Anyone have the same problem? Anyone have a suggestion? Am I doing something wrong? Thanks. almond cashew granola bars recipe, should cashews be salted? And is the honey measurement by volume or weight. 12 ounces or honey by weight is not 1 1/2 cups when measured with a liquid measuring cup. Thanks! 1. Do you use/prefer salted or unsalted cashews? 2. Is the honey measured by weight or volume? I.e. Is it a cup and a half by weight which would equal 12 ounces or volume by using a liquid measuring cup? of the granola bars, it's probably because you are not mixing the toasted oatmeal/nut mixture with the honey in a separate mixing bowl and then spreading it out onto the cookie sheet.